Marc Maron is a popular American stand-up comedian, actor, podcast host and writer. 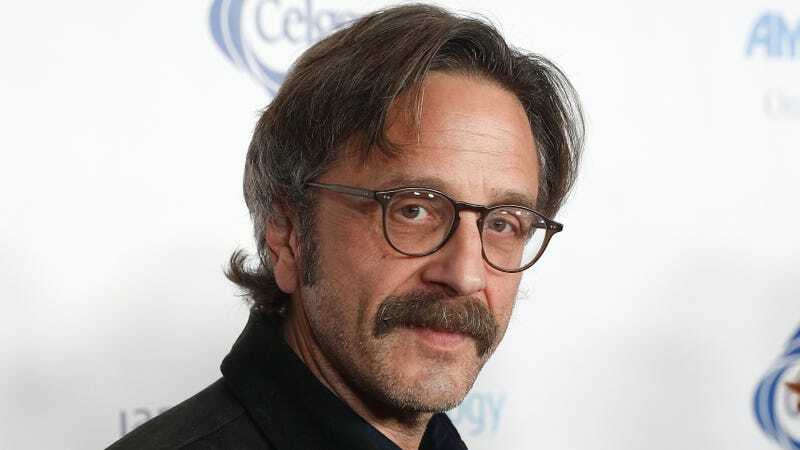 He is widely known all through America and the world at large for his popular podcasts and radio shows some of which include WTF, The Marc Maron Show, Breakroom Live, and Morning Sedition. In 2018, for his work on GLOW, he was nominated for Best Supporting Actor in a Comedy Series at the 8th Critics’ Choice Television Awards held in Santa Monica, California. He was also nominated for Outstanding Performance by a Male Actor in a Comedy Series and as part of the cast, when they were nominated for Outstanding Performance by an Ensemble in a Comedy Series at the 24th Screen Actors Guild Awards held in Los Angeles, California. The American comedian was born into a Jewish family in Jersey City, New Jersey on September 27th 1963, with the full name Marcus David Maron. The podcaster had his elementary and high school education in Albuquerque. He went to Highland High school and upon graduation from high school, he got admitted into Boston University, graduating with a B.A in English Literature. The stand-up comedian had his first stand-up comedy performance in 1987, he was only 24 years at that time. He later went professionally into comedy, featuring at ‘The Comedy Store’ located in West Hollywood, Los Angeles California. Marc was also an associate to late American stand-up comedian and actor, Sam Kinison, back at The Comedy Store. He featured regularly on the Late Show with David Letterman and Late Night with Conan O’Brien between the 90s and 2000s. The podcaster moved to New York from Los Angeles and reportedly seen at comedy venues and making appearances in theatre productions. In 1994, he joined the Boston Comedy club featuring a few times on “Monday open-mic night” which was organised by Tracy Metzger at the club’s location in Greenwich Village. Sedition and Breakroom Live which aired from 2004 to 2009 on the radio network, Air America. In September 2009, he started hosting the WTF podcast which aired twice every week from his garage in Highland Park, Los Angeles, California. The actor starred in Maron, a T.V comedy series aired on IFC, featuring also as a writer and executive producer. Presently, he stars in the American comedy web T.V series, GLOW. The series first season was released on June 23rd 2017 on Netflix with the second season premiering on June 29th, 2018. Super talented stand-up comedian, podcast host, actor and writer has had a successful career so far as and has an estimated net worth of about $2 million. A report in 2014 listed his WTF podcast show as the third highest-earning podcast among 20 others with a revenue of $14,640 per episode ($4,320 for the 20 seconds pre-roll ad, $6,000 for the 60 seconds mid-roll ad and $4,320 for the 20 seconds post-roll ad) and 250,000 downloads per episode. Marc Maron was raised by his parents – Barry R. Maron and Toby Maron in Wayne, New Jersey, where he lived till he was six years old. His father, Barry, was an Orthopaedic surgeon and served for two years in the U.S Air Force in Alaska for his postgraduate training/residency as a medical practitioner. At the expiration of the two-year time frame, Maron’s father, who had moved to Alaska with his family, again, moved them to Albuquerque in New Mexico where he started his own private medical practice. The only known sibling of Marc Maron is his brother, Craig Maron. However, there is hardly any information available about him. Who Is His Girlfriend or Wife? The comic star has had his fair share of relationships turned sour having gone through several relationships and two failed marriages. He got married to his first wife, Kimberly Reiss, in 1997. Their divorce was finally settled in 2001, ending the marriage between Kimberly and Marc. In 2004, barely 3 years after his divorce with Reiss, he got married to American humourist, Mishna Wolff. Sadly, the union ended in 2007, after lasting just 3 years. Maron then began dating Jessica Sanchez and got engaged to her only to announce their breakup on an episode of his podcast in October 2013. On another podcast which aired on February 10th 2014, Marc publicly announced that he was in a relationship with Moon Zappa. Unfortunately, the relationship did not last up to 3 months. The actor/writer, again, made an announcement sometime in 2015 on an episode of his podcast, that he was dating Sarah Cain, an American contemporary artist. The comic actor stands tall at a height of 1.8m which is equivalent to approximately 5 feet 10 inches. He weighs 78 kg and tries as much as possible to maintain his weight by working out three or four times every week. Speaking just before his interview with Jon Hamm on an episode of his WTF podcast, Marc Maron revealed that he had gained 10 pounds on the road and was so cool with it that he was ready to change pants sizes and keep enjoying his food and living his life. However, the comedian later turned around and vowed to rather go on a 4-Hour Body diet rather than let that happen.